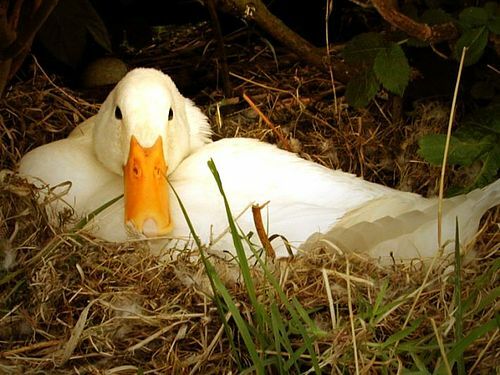 There is a duck who has chosen to lay her eggs outside of the dorm where I live. Hopefully, if everyone leaves her alone, the eggs will hatch and everything will be fine. But if enough people mess with the duck that won't happen. I walked out today to see two girls go and sit right next to the nest. The duck was scared and ran away, quacking. One girl said "why is the duck running away from her nest?" The other said "because she is stupid and doesn't care about her things." This frustrated me. The duck isn't stupid, girl #2. She ran away because you scared her and she does care about her "things," and the word you're looking for when you said things is eggs.